I begin to write as I am getting into bed. I don't want to wipe off my make up and the day with it. I don't want to go to sleep and begin a new day tomorrow. I don't want today to end. 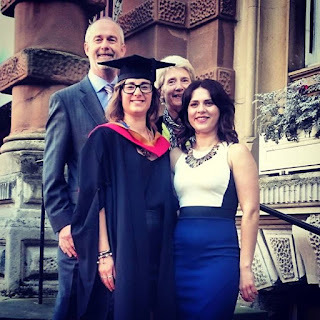 Today is the day graduated, an achievement I always wanted to accomplish but was not sure that I would. 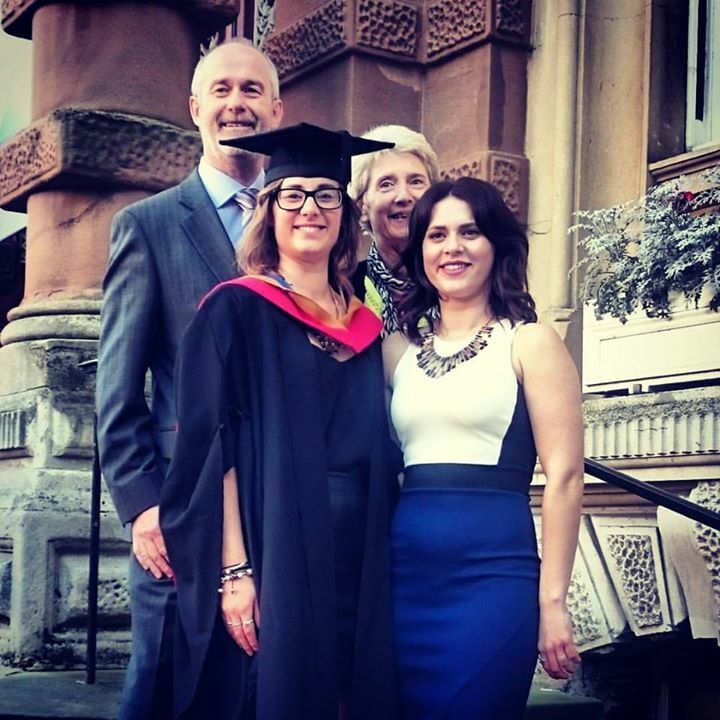 I graduated on Tuesday. The excitement had been building in the run up to the day itself, receiving tickets, shopping for new outfits and party planning. The day really began when I stepped out of the shower at 10.30 and started to get ready. I had bought my outfit from River Island a few weeks before, the high waisted leather skirt and black top. I was a little worried that I may get a bit chilly throughout the day as it is now autumn so the Sunday before I happened to buy a slouchy green jumper from H&M which I thought would go really well to slip on before and after the ceremony. I finished my outfit off with a gold necklace my friends bought me for my birthday, although you couldn't really see it with my gown on, and an old pair of black shoe boots. My parents and sister arrived at mine just before midday. We drove to the quayside for an al fresco lunch. My parents and I tucked into chicken, bacon and pesto wraps and my sister a bacon sarnie. I was extremely lucky with the weather, it was a bright, sunny and reasonably warm day for this time of year. We sat looking out at the water and boats in the marina, beautiful. My sister also gave me a small wrapped box. 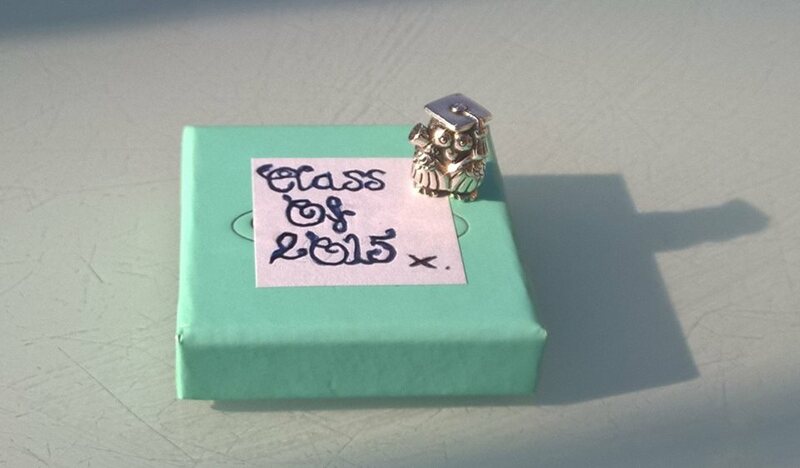 Peeling away the paper revealed a box labelled Class of 2015 and inside the cutest charm for my bracelet! After lunch we headed to the Town Hall for the ceremony. I made plans to meet my friend outside, we greeted each other with smiles filled with excitement and nerves and headed inside to collect our hired cap and gown. We were dressed and guided through to have our official photographs taken. After all of this there was still some time to take some photo's outside with friends and family before the ceremony began at 3pm. The ceremony began with a formal procession of the university faculty members dressed in their ceremonial outfits. There was then some short speeches and the introduction of the honourary fellow, Maureen Reynel MBE. Maureen founded and continues to run a local charity, FIND, supporting homeless individuals and those living on a low income. The charity is well known for providing food parcels but also offers other types of emergency aid such as; household and nursery items. Having worked alongside Maureen in the summer of 2013, I found her presence and speech very meaningful and moving. She spoke about her work but also the responsibility we have to consider the lives of others and our contribution to society. That we should be mindful of our judgements of others, we cannot know what has led them down that particular path and there is no reason why we should not treat everyone with respect. Maureen has achieved a lot in her lifetime, although perhaps not in a way that others would judge as so. Her achievement has been based in helping others through fostering and her charity work. Maureen is someone I admire and aspire to be like, her caring nature, motivation, dedication and passion. Graduates were then asked stand, row by row and line up by the stage, wait for their name to called, walk across the stage and receive their degree. This is the part of the ceremony I have been dreading and was extremely nervous about. I am not someone who likes to be up on stage or pulled out from a crowd. 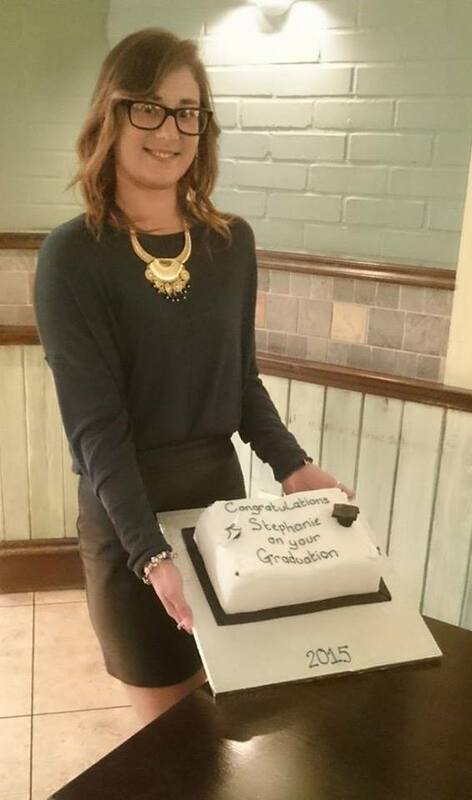 I was also very anxious about walking across the stage without tripping in my heels. I managed the walk without tripping! After the walk my nervousness dissolved and I was free to enjoy the rest of the day. When the ceremony concluded the graduates were asked to file out onto the front steps of the Town Hall for our official class photo. Walking out through the wide open doors I saw the rest of my family ready and waiting. My parents and sister had guest tickets so were present during the ceremony. Seeing the faces of my family members light up filled me with happiness and pride. The day was made special for me by the presence of my family. Without them it would not have been the same. I am aware how lucky I am that so many family members could make my special day and for that I am grateful. After a few more photographs we headed to a local restaurant for a family meal and cake! Dilemma: How do I do it all?